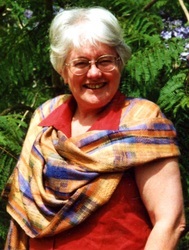 Elizabeth has been a member of NSCG since 1994. Elizabeth completed an advanced certificate in Weaving, Spinning and Designer Textiles at Strathfield School of Textiles. She has attended workshops with numerous overseas tutors including Peter Collingwood, Lavonne Schreiber, Clotilde Barrett and Naomi Speicer. Elizabeth is a member of the Society of Arts and Crafts and has exhibited at the Australian Craft Show. Elizabeth enjoys hand-dyeing her yarns for special effects and colour combinations in making fabrics, rugs, wrap scarves and for multi coloured embroidery yarns.